Are you looking for the best childrens entertainer in Bournemouth? Or a children’s magician in Bournemouth that will amaze your audience? 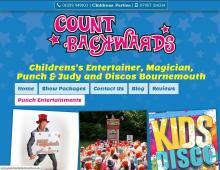 Count Backwards have the perfect entertainment package to give your child a birthday to remember. Count Backwards have been delivering entertainment options including kids disco packages, magic shows and Punch & Judy shows throughout Dorset for many years. The Count is an energetic kids party entertainer that has worked with large corporations in the entertainment industry such as P&O Cruises and Thomson Holidays. DJ Simon creates fun filled kids disco parties using bubble machines, foam machines and smoke machines together with traditional and modern party games and wacky competitions. With popular sing a long songs and floor filling party dances Count Backwards has a disco package to suit your kids party. The crazy Count is known for his mixed up muggles, whether you are looking for a children’s magician for your childs birthday party, a school show or fete, an entertainer that can deliver an explosive street show or a magician for your cruise ship The Count has something up his sleeve for you. The world famous Punch and Judy show is performed by Professor Count using traditional Punch & Judy puppets, a handcrafted red and white striped proscenium surround and professionally made puppets. Contact this amazing kids party entertainer in Poole, Bournemouth and Dorset for more information on the unique party packages on offer.